Summary. This is an emergency message of extraterrestrial civilizations (ETC) about necessity to organize the united consciousness of a civilization for Transition to the next cycle of life. The location of this crop circle near ancient Burial Chambers is ETC warning about the beginning of the first preliminary cataclysm in the nearest time. The pictogram has two main lines – the line of consciousness and the line of planets. The line of consciousness consists of five horizontally placed big circles. Two lines of planets form two increasing dark circles lines attached to the last circles of the line of consciousness. Each of five circles of consciousness line is a symbol of unified consciousness cell (Fig. 1). Number 5 points to the fifth highest level of consciousness – the united consciousness of civilization. Around the central circle of the consciousness line is shown another circle of bigger diameter by a thin line (Fig. 2). The central circle and the thin line circle represent the combined information cell – it is combined image of individual cell (Fig. 3) and cell of the united consciousness (Fig. 4). The thin line circle represents a boundary of both information cells. Light circle in the center is a brain area of individual cell (Fig. 2, Fig. 3), and the dark central circle is an extended brain area of the united cell (Fig.2, Fig. 4). Symbol of combined cell informs about the necessity to transfer from individual consciousness to the united consciousness. 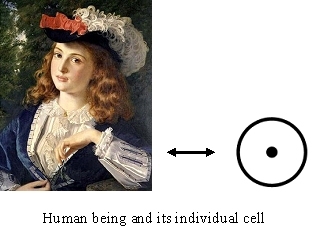 According to an analogue code of ETC an individual cell of human being is a representation of human being on information level. Structure of a cell determines a level of object’ consciousness. The individual cell of human being is represented by a ring with a small dark circle in the centre. The circle in the centre is a brain area of a cell; a ring – a cell’ border; area between them – a body area of a cell. Information cell have not only human being, but also all objects of organic and inorganic nature of a natural origin. However the cell structure is defined by consciousness level. According to an analogue code of ETC the united consciousness cell is a representation on information level communicating people. The united cell has an expanded brain area as a result of unification of brain areas of individual cells of communicating people. Let’s return to the pictogram decoding. On top and bottom of the center circle of consciousness line two dark circles of middle diameter are shown (Fig. 5). They represent brain area of individual cells. There are four such circles placed on thin line circle (Fig. 6). It points on the fourth level of consciousness – consciousness of human being. Therefore, this pictogram transmits information about us. These two dark circles of middle diameter (Fig. 5) – brain areas of individual cells – represent the principle of the united consciousness formation. It informs that unification of two individual cells with a small brain area (Fig. 3, Fig. 5) form the united consciousness cell with an expanded brain area (Fig. 4, Fig. 5). In the process of individual cells brain areas unification on the information level of the Universe the rearrangements are taking place. These rearrangements cause in our material world an action in accordance with the set goal. This action of the unified consciousness ETC use for body transformation for intergalactic flights in universe and overcoming hundreds of millions of light years. To the last circles of the main line of pictogram from both sides (Fig. 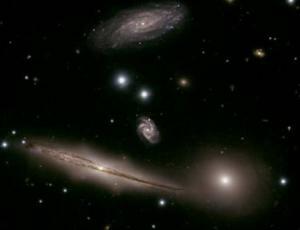 7) are attached six dark increasing circles (Fig. 8). They form two side lines. It shows the last six planets of the Solar system from Pluto to Mars. In decoding of the previous pictogram May 9, 2010;we already informed that the main purpose of universe – is the formation and development of consciousness. Accordingly, in the Solar system are presented planets of past, present and future development of consciousness. In our Solar system consciousness develops in the direction to the star. Therefore, on pictogram diameters of circles increase towards the past into the future, i.e., from Pluto to Mars. Two last circles of the main line of pictogram (Fig. 9) combine two images simultaneously. They both represent an information cell, and a planet. On the one hand this circle is a prolongation of planets line and presents seventh planet – the Earth. On the other hand this circle belongs also to the consciousness line and represents the united consciousness cell. Thus, ETC confirm, that on Earth have to be formed the unified consciousness of all civilization. ETC urge us to form the unified consciousness of all humanity in order to make the Transition to the next cycle of life. They confirm that this is the only way to avoid cataclysms. The crop circles researchers have pointed long ago that ETC for some reason put their pictograms in certain places. First of all, for some reason county Wiltshire was selected. Just in this county the greatest number of crop circles arises. ETC pictograms arise in fields near hills, shrubs and trees. They can be found even at a crossroads. However, ETC has never put their messages near burial facilities. As a result of big number of ETC pictograms decoding the study revealed the following. By certain position of pictograms ETC pay our attention to located not far megalithic facilities, depicting the main symbols of information transmission. Among them are: Stonehenge, stone circles Avebury, barrow-pyramid Silbury Hill. That is why ETC selected the county Wiltshire. Sometimes for the disclosure of pictograms contents ETC use objects of nature or manmade, reflecting the main idea of the transmitted information. It is their gentle hints. By this way ETC are helping humanity to understand their messages coding. That’s why we are confident that the location of pictogram in this place – next to the ancient burial graves – is very symbolic. This is because in all pictograms ETC warn about critical weakening of Earth’ magnetic field and the occurrence of global cataclysms. They also warn that before global cataclysms three preliminary cataclysms of incredible strength will occur. Mankind for the first time will run into such natural phenomena. So, by the location of this crop circle near ancient Burial Chambers ETC warned about the beginning of the first preliminary cataclysm in the nearest time. Important part of the pictogram is a turn. It occurs on the information level of the Universe and accompanies decision-making. Correct decision-making corresponds to right-hand turn – clockwise. Wrong decision – to left-hand turn – counter-clockwise. This pictogram depicts a counter-clockwise turn, i.e. left-hand turn. By this left-hand turn ETC warned that if humanity takes the wrong decision – not to unite consciousness, the future of our civilization is presented near the pictogram as burial facilities. Failure to take any action, i.e. omission as consistent with this result, since the beginning of global cataclysms, the continuation of life of our civilization will no longer be relevant. Failure to take any decision, i.e. inactivity also corresponds to the same negative result. With the beginning of global cataclysms, the question of continuation of our civilization’ life will no longer be actual. Thus, the pictogram, on the one hand, shows the consequences of wrong decisions of our civilization – individual consciousness. Each of us is still in the mode of individual consciousness and civilization has not yet made a decision about consciousness unification. On the other hand pictogram shows the only right way. ETC confirm that our entire civilization should unite consciousness. As a result through our body transformation we will make the Transition to the next cycle of life and global cataclysms will not influence us.